Florida lawmakers joined a growing trend last year when they allowed the establishment of Veterans Courts if approved by the chief judge of the circuit. But some Florida judges were already dealing with veterans issues separately on their daily dockets. 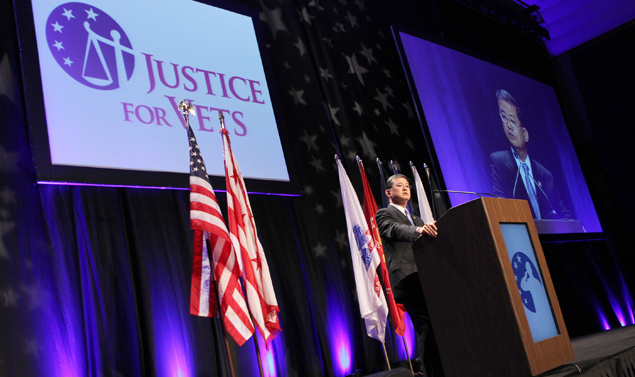 The success of Veterans courts was noted this week by Secretary of Veterans Affairs Eric Shinseki at an inaugural conference for Veterans Treatment Courts held by the National Association of Drug Court Professionals in Washington D.C.
For Veterans entering the justice system who are already dealing with mental health or substance abuse issues, we have established Veterans Justice Outreach (VJO)—172 full-time specialists, working directly with justice officials, to see that Veterans who are before the court or already in jail get the care they need and that courts are supported in their consideration of best possible alternatives to incarceration. We are also working to connect our VJO specialists with American Indian tribal justice systems to do the same thing. In their first year, 2010, VJO specialists served 5,800 Veterans. This year, that number is up to nearly 36,000 Veterans, and we plan to hire another 75 specialists next year. The core of the Veterans Treatment Courts is first the judge who is familiar with issues some veterans struggle with like traumatic brain injury and PTSD and it offers a team approach for defendant to receive support and services from veterans groups, VA specialists and social support experts. Find more information and a map of available Veterans Courts here. The complete transcript of the Secretary’s speech is available here. 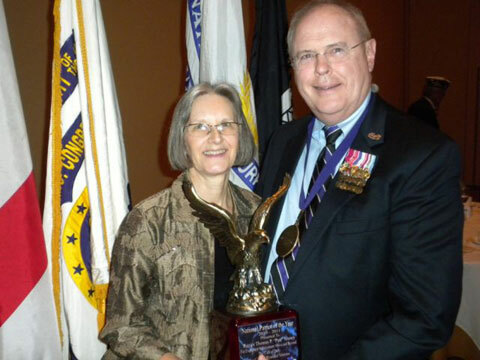 Judge Patt Maney and his wife Caroline when he was awarded Patriot of the Year (2010) by the Military Order of the Purple Heart. This year, lawmakers gave Florida’s chief judges the power to set up a “Veterans Docket” for military members and veterans in minor legal trouble. Retired Army Reserve Brigadier General and Okaloosa County Judge T. Patt Maney advocated for the idea. Maney understands those veterans’ problems first-hand. His vehicle was blown up by improvised bomb when he was serving in Afghanistan in 2005. He spent almost two years in Walter Reed Army Medical Center in Washington D.C. recovering from injuries including traumatic brain injury or TBI. In an interview with Bobbie O’Brien, Judge Maney shares what it’s like living with TBI symptoms where you struggle to accomplish even the simplest task like using a self-service gasoline pump or remembering a word. BOBBIE O’BRIEN: At that point were you thinking I’ll never be able to sit on the bench again? MANEY: Well, the Army had already told me they were going to medically retire me and I was convinced at that point I was not going to be able to go back on the bench because I did not at that point have the capacity to do the job. People want judges not only who are fair but judges who listen, who remember and then apply law to the facts they’ve heard in evidence and I couldn’t do that. O’BRIEN: That had to have been a terrifying time for you?